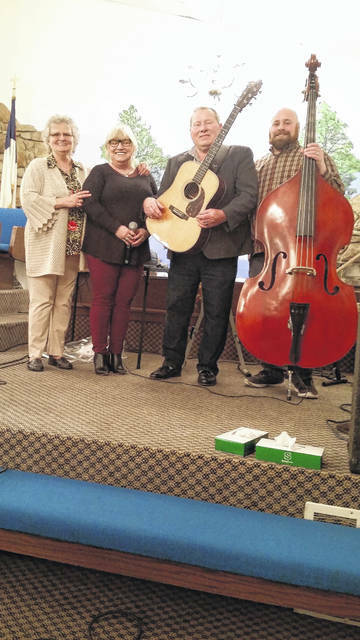 Join Rose Avenue Community Center (RACC) as the country/southern gospel music group “Glory Bound” ministers in song and worship tonight at 7 p.m. Featuring spirit-filled, live southern/country style gospel music at its best, Glory Bound brings powerful harmonies and great live music to share the good news of Christ Jesus! Glory Bound features Dave Palmer on guitar and vocals, Johnnie Yeary and Gerry Lynn Jones on vocals, along with Jerry McGuire on bass, and they love to share their testimony of how God’s grace saved them and led them from singing individually in church to come together as a group praising Jesus’ holy name in venues around Ohio. Gospel Music Family Fridays, an outreach of Rose Ave. Community Center and Church, is presented every Friday at 7 p.m., doors open at 6:30 p.m. Bringing different local, regional and national singers, musical groups and recording artists to the stage each week, all for the glory of God, they offer free admission, free food and drinks, and free shuttle service, in-town. To help support this ministry, a free-will offering will be received. Rose Ave. Community Center is located at 412 Rose Ave. in Washington C.H. For transportation please call the office at 740-636-ROSE(7673) before 5 p.m. Fridays. Join us every Saturday at 5 p.m. for a free community meal and contemporary worship service in a relaxed, come-as-you-are atmosphere. Featuring an upbeat and relevant, Bible-based message from Pastor Justin, doors open at 4:30 p.m.
Free transportation is also available for this event by calling the office before 3 p.m. Saturdays. Regular office hours are Monday-Friday, 2 to 5 p.m.